Reduce Stress by saying NO! Ways to say no and cut down on your stress. There will always be more to do that there will be time to do it. The ability to say no and keep the stress in your life to a minimum is an important component of good mental health. Other people, of course, want you to do the things they want and so they take your yes for a given. Not telling people no can become the same as saying yes. Learning to be more assertive and to tell people no can help you keep your emotional life in balance. Saying yes too much steals time from the things you really want to do. We would all like to make others happy. Sometimes it feels uncomfortable to say no to others. Every time you say yes or more importantly fail to say no you give up a little bit of you. You get 168 hours of time each week. Spend them wisely. There will always be competing requests for your time. Your boss wants some, so does your spouse or partner. If you have kids they want all of your time they can get, at least until they become teens. Your friends and family will also want some of your time. So do these people who call you on the phone or pound on your door wanting to sell you something. Each time you let them have some time because you do not want to be rude or curt, you risk giving away some of the time you had planned to spend on something else. When your life is over-full there is no room for new people or new activities. If you let casual acquaintances take up your time, you spend that precious resource on them. If those people in your life ask you for money, whether you have it or not, remember that most of us have to give up some of our time to get that money. The more they ask of you the less there is for yourself or others. If you have people in your life that take up your time and do not add value to your life, they are taking the place that could belong to someone else. Until you end a bad relationship there is no time or room in your life for a new one. You can’t start something new till you end something you are doing now. Any new activity will take time. Going back to school, starting a hobby, doing some traveling, they all require time. Doing things you do not want to do spends your time. You will run of that time reserve eventually. Saying yes comes at a cost. Saying yes creates an obligation, to yourself and others. The more the obligations the less the resources you have for you and the things that really matter. No not create obligations and then develop resentments because those other people are taking up your time. 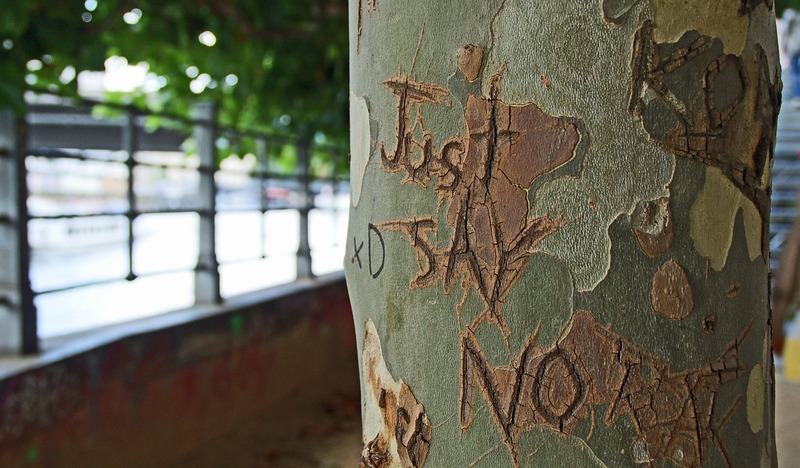 Saying no does not make you a bad person. If you feel that saying no is selfish or makes you a bad person think again. There are lots of good reasons to tell others no. Having good boundaries protects you and it protects others. Your children need to learn the word no and who but you is better qualified to teach them the power of no? Giving reasons for your no sounds like you want to be talked into it. If you have decided that the answer to this request should be no, state that answer and leave it at that. Offering reasons why you would like to do something but can’t just open the door for the other person to offer ways you can do what they requested. Offer choices if you might want to do something another time or way. In getting out of things, offering alternative choices can be a close cousin to saying no. The answer may be more like “I can’t do what you are asking but I can do —.” Consider this option if you do have something you would like to do with or for the person making the request but the original request is something you chose to not do. You do not have to give everyone an answer the moment they ask the question. Many people have one of two default responses. They either say no to everything and regret it or they say yes to everything and regret a lot of those yes’s. You can answer that you need time to think it over and then make that decision at your leisure. Talk or write the decision out. If you find it hard to make a decision and then stick to it consider writing out the request, the possible options and then what will happen if you say yes, no or yes with some changes and qualifications. Writing things out can often bring the correct responses into focus. Talking things out with a trusted friend or adviser can help clarify both the right decision and why it may be difficult for you to tell this other person the “No!” you are really feeling. Do you have difficulty telling people no? How might your life be different if you practiced the “saying no” skill? This entry was posted in Self help skills and tagged Counseling, emotions feelings, Mental Health, saying no, stress reduction skills by David Joel Miller. Bookmark the permalink.